Rubenerd: Bruce Schneier facts, again! Back in 2006 I posted some of my favourite Bruce Schneier facts. Here we are in 2010 and I still read ones that make me laugh out loud! The sum of the ASCII values of the characters in Bruce Schneier’s passwords is always a prime number. Their product is too. Bruce Schneier; brain the size of a planet…. Reduced to writing about encryption for mortals; gets very depressed. 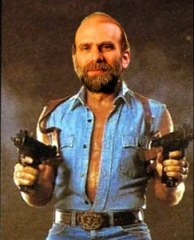 Bruce Schneier can read and understand Perl programs. There are no prime numbers, only numbers Bruce Schneier lets you factorise. Bruce Schneier knows a deterministic algorithm to generate non-pseudo random numbers without need of an entrophy source. Newer post ← @cb60089 just bought me coffee!